Today started out awesome – everything was on an even keel and productivity was high. 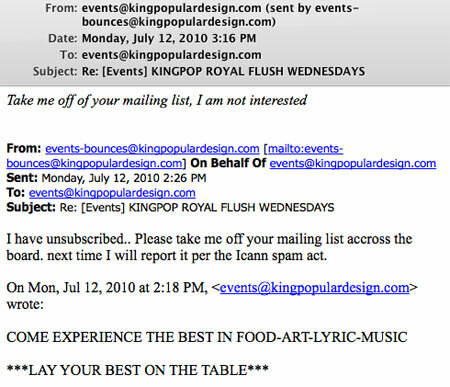 Around 1pm, I got this lovely message: “Welcome to the Events@kingpopulardesign.com mailing list!” Wow, I didn’t realize I signed up for this, since I have no idea who this is or why I would want to know about their events. This email came into my ‘good inbox’ – i.e. the one that usually just has ‘real’ emails. I use my yahoo email account to sign up for mailing lists, webinars, etc. where it’s likely I’m going to be added to lists, so it’s rare that I get outright spam to the main account. Being the good internet citizen I am, I promptly followed the instructions and clicked the link to unsubscribe. No big deal. So I thought. Fast forward a couple of hours, and the wheels started coming off the tracks with this little ‘welcome email.’ Evidently the lovely people that set this up had it set so that every reply to the email was sent to THE ENTIRE LIST. I’ve seen this before, and I knew what was coming. First it was just one or two, then 3 or 4, and now it’s a total tidal wave of emails from pissed off people that not only didn’t sign up for this email list, but now they are getting all the angry unsubscribe emails too. It’s like a snowball and once it picks up steam, it just has to run its course. People don’t realize what they are doing by replying – they just want off the list. Contrast this experience with another one I had just a couple of hours ago over at Sarah Robinson’s Escaping Mediocrity blog in her 30 days to Creating Irresistible Presence series. See, Sarah and her community are some of the most incredible people you’ll run across on the web, and the conversation today was elevated even higher thanks to a really nice guest post by Chris Guillebeau. I’m already a huge fan of Chris and his writing, but this post really was exceptional in that it started an incredible conversation in the comments. If you check out the post and the responses, what you’ll notice is that there is a real, authentic, meaningful conversation occurring, which is what really matters, right? It’s not about numbers or statistics, or how many people got blasted with messages – it’s about true engagement with people that care about the subject of the blog, and also each other. This is the kind of community that I choose to participate in, and I made several new connections over there just from this one blog post. What do you think these guys accomplished by ‘opting in’ this mass of people to their mailings? Did they gain anything meaningful or do they just have more people on their ‘opt in’ list now? I’m always surprised when I see these kinds of tactics at this point in the evolution of the internet. I guess I just think it’s way easier to build a list the right way, by offering something of value that people actually want in exchange for signing up. Call me old school – that’s just how I roll. If you’re ever tempted to take shortcuts to building a vibrant community, consider that all your efforts can be washed away easily if it’s not built on a strong foundation of trust and mutual respect. You can’t just throw money or email addresses at it – you have to actually do the work to build trust. Just think about the scenarios above – which company or individual would you trust if you got an email from them tomorrow? Bottom line: Gold star for Sarah’s blog. 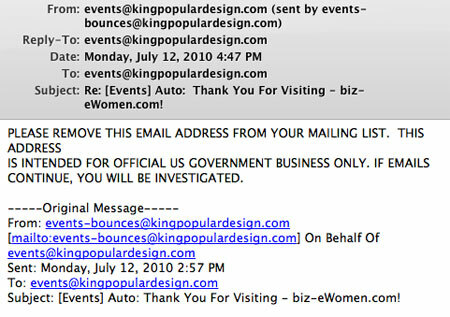 Colossal FAIL for @KingPopDesign.